This is the other side of that rare, red, French Polydor that I posted so long ago. 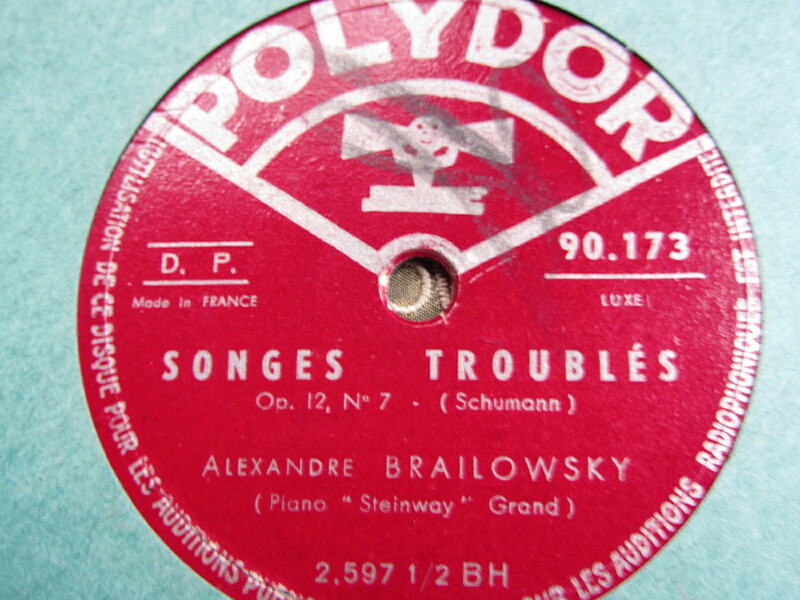 It is Brailowsky (solo piano) playing Robert Schumann’s “Songes Troubles”; “Traumes Wirren” in the composer’s native German, or: “Dream Disorders” in English. I also really like how the piano was recorded. Quick notes on Schumann: his parents were not musical but they encouraged his interest in music with piano lessons from the age of 10. However, his family was later to be beset by tragedy. When Schumann was in his teens, his father died and his sister committed suicide in quick succession, events that were to have a deep impact on the young musician. Initially music was to take a back seat in his life. For his main subject he studied law at Leipzig while simultaneously continuing his music studies. One of his music teachers was Friedrich Wieck whose daughter Clara showed a great talent at the piano while she was only 9 years old. A further tragedy was to hit Schumann when a mishap damaged one of his hands and spoiled his chances as a pianist. Some accounts blame a device he used to strengthen his fingers, but other theories suggest mercury poisoning as a side effect of his syphilis treatment. After the accident, Schumann was to concentrate more on composing.